If you’re using Vista you might have come across UAC (User Access Control). It’s a security feature which protects your computer from various threats like malicious programs, privacy breakers, etc. Whenever you open a new program or start an installation or anything for that matter, it opens up a box in which you have to give your permission to continue. Well, this is pretty good as it protects your computer but at the same time it’s a bit annoying as it keeps on popping every now and then and it doesn’t remember users choice, so you have to keep clicking continue even on the application that you launch frequently. Some people because of these cons simply disable UAC. To overcome these problems and still serve as a good security protection, a new updated version known as Smart UAC Replacement has been developed by Security Stronghold. All disadvantages of Windows UAC have been corrected in this version. 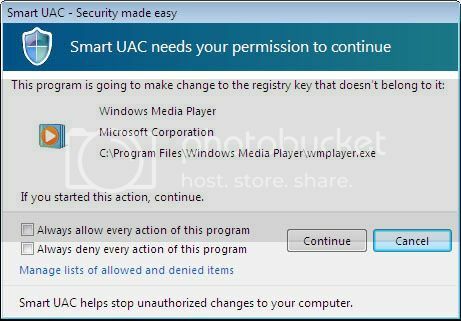 Smart UAC unlike the default Windows UAC remembers users choice, you don’t need to keep continue every time you launch the same program. It also has an extensive database of more than 300 000 known threats raises your protection level even higher. >Smart UAC remembers your choice! 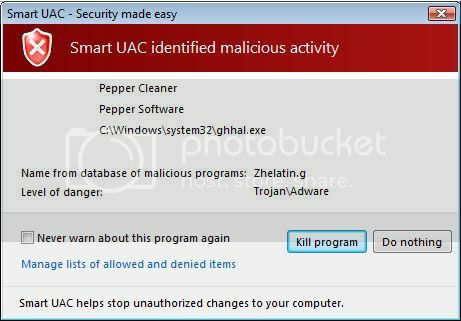 >Smart UAC Replacement tracks harmful and suspicious processes and finds both known and unknown malicious programs and prevents their activity.